Best for maximum binder capacity! These economy weight protectors are best for maximum binder capacity! Reduced glare finish aids in visibility of your materials. Just like all of C-Line's polypropylene top loaders, these come with a reinforced binding edge for long lasting use and provide acid-free protection. 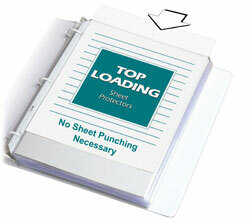 Perfect for use in training manuals and other lengthy documents you store in standard three-ring binders. No sheet punching necessary. 100/BX. Economy Weight Polypropylene Material --- Looking to fit as much information into one binder as possible? Economy weight sheet protectors are extra thin to maximize binder capacity and are great for training manuals and other lengthy documents. Polypropylene material provides acid-free protection with no photocopy transfer. Letter Size Document Storage --- These sheet protectors are made to store and protect 11 x 8-1/2 documents in standard 3-ring binders. Although they can be used to store smaller size pages, they are ideal for letter-size documents. Reduced Glare Finish --- Reduced-glare sheet protectors are similar to non-glare sheet protectors and eliminate most glare. Unlike non-glare sheet protectors, reduced-glare sheet protectors do not use a special resin to manufacture the product; they simply use a special embossing pattern which helps knock down glare for materials being viewed under moderate or bright lights. Three-hole Punched --- Sheet protectors are three-hole punched. Sheet Protector Special Features: Economy weight can maximize the capacity of any standard three-ring binder. Suggested Use: Use for storing large documents in a binder, since the extra thin sheet protectors increase your binder's capacity.